The ABAC American Separator Replacement - 8234130 features a support tube secured by higher than normal amounts of borosilicate glass. The ABAC American 8234130 is equipped with a capacity of 565 cfm, an increased capacity similar to pleated air oil separators. 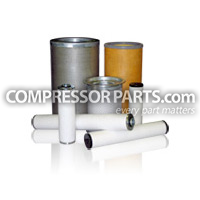 The initial pressure drop is kept low by this deep filter and also maintains residual oil content. This filter is a best-priced substitute for the ABAC American 8234130 that meets OEM specifications.